The highest-grossing movie of all time, Avatar,features a giant willow-like tree that represents the center of culture and religion for the Na’vi inhabitants of the planet Pandora. The tree has extreme spiritual significance because it allows the Na’vi to communicate directly with their Mother Goddess, Eywa. It also allows them to connect at the same time with their long lost ancestors, as the tree is able to preserve people’s memories and experiences. 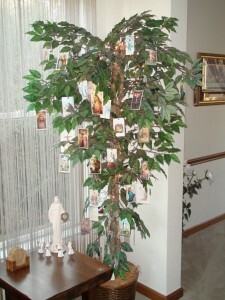 Our family has a Tree of Souls in our home, too, but it is not exactly like the one in the movie. The idea came to me recently when I was wondering how to celebrate better the month of November. November is a significant time in our Catholic faith because it is the month in which we consider the end times – ours as well as the world’s. It is also a time when we honor our deceased loved ones and remember in a special way the Holy Souls in Purgatory. The kick-off feast days to this month, All Saints Day (Nov. 1st) and All Souls Day (Nov. 2nd) set the pace for the next several weeks. However, at least in our home, these important feast days seem to get overshadowed each year by the frenzied excitement of Halloween costumes, parties, and trick-or-treat night. Retail stores, meanwhile, persistently remind me (and my children) that Thanksgiving and Christmas are right around the corner and that it’s time to start preparing. November seems to quietly slip away, and I find myself feeling disappointed that I missed out on an opportunity to evangelize. This year, I’ve decided to try something new. I remembered that I have a growing collection of memorial cards from funerals that we’ve attended through the years. Each one features the person’s name and date of birth and death along with an image and a prayer or passage from Scripture that was special to that person. I’ve never felt comfortable throwing any of these away, but I have way too many of them now to keep in the pages of my Bible. Then, I had an inspiration. We have an artificial ficus tree in our front living room that I keep adorned in tiny white lights all year long, just because the tiny white lights make me feel joyful. Every December, the tree serves as our Jessie Tree. This November, however, it has taken on a new role: our Tree of Souls. I hole-punched the memorial cards and hung them with green ornament hooks all around the tree. As I look at each one, I remember with a smile (and sometimes a tear) these beloved friends and relatives who have gone to a better place. I pray for them and hope they are praying for us, too. So I guess in a way our Tree of Souls is like the one in Avatar because it, too, connects us with our loved ones and their memories. As the cards are illuminated by the glow of the little white lights around them, it’s the perfect visual reminder our family needs at this time of year that says it is good to celebrate life and the passing of that life into an even greater existence. We, like the Na’vi, are all connected to one another here on earth, in eternity, and to the God who created us.